We have provided resources on this page that help make it simple to sell your house fast or avoid foreclosure. Every day, we work with homeowners who cannot afford the traditional route of selling through a Realtor but still need to sell their house fast or those who are in the process of foreclosure. We’d like to be the resource that solves the problems you are facing today. It would be our pleasure to answer your questions, discuss all of your options and explain step-by-step how our “home buying” program works… Our program is 100% aboveboard, easy to understand, and might be the perfect solution for you. Free Guide: The Pros and Cons Of Selling A House To A Professional House Buyer – We provided this updated guide to explain the 3 options available when you need to sell your house. 1) Listing with a Realtor. 2) Selling it on your own. 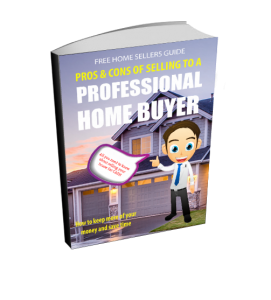 3) Selling to a professional house buyer. This ebook will describe the pros, cons, fees, and timeframes you can expect with each option… and it will help you figure out which option make the most sense for your situation. Download your free guide here. Washington Post Article: Selling a home to a real estate investor – Excellent article that explains how the process works when you sell to a real estate investor. They offer excellent advice when they state that you should be sure to deal with an investor who can actually deliver what they promise. Some investors make offers that they are not able to honor. Because we provide all of our own financing, we are able to honor every offer we make. FDIC Information: Foreclosure Prevention – The FDIC (a government agency) has provided some valuable information and a “Foreclosure Prevention Toolkit.” Be sure to check it out if you are currently facing foreclosure. Foreclosure Prevention Resource – An informational guide on foreclosure prevention developed by the Urban Affairs Coalition. Walks you step-by-step through the foreclosure process. Want to learn more about the foreclosure process and Ways To Stop Foreclosure? 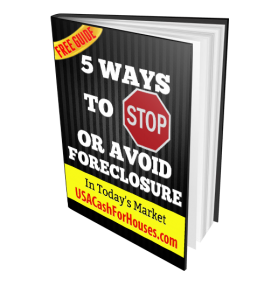 Download your free 5 Ways You Can Stop or Avoid Foreclosure In Today’s Market Guide here. Or, you can simply Contact us at any time if you have any questions, would like a free no obligation evaluation of your situation, or simply want to learn more about how our program helps distressed homeowners avoid foreclosure or quickly sell their property for cash.